5th Annual Tablets For Tots – MISSION COMPLETE! FALLEN NOT FORGOTTEN FRIENDS AND FAMILY it is that time of year again! Founded in 2012 to raise funds and assist gold star families with educational expenses. 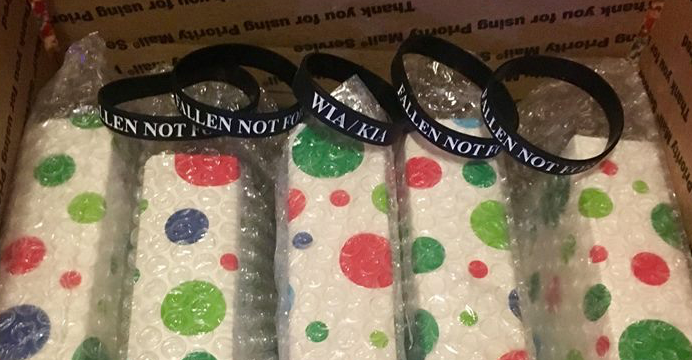 In December of 2013, Fallen Not Forgotten decided to sprinkle some smiles and conducted its first iPad mini give away to gold star children throughout the United States. Since starting this annual event, due to an AMAZING amount of support from the Fallen Not Forgotten Family “WE” (With Everyone) have been able to surprise more than 58 children with free iPad mini’s! With your support WE are looking to do this again this year! At Fallen Not Forgotten WE believe that WE owe an unlimited debt of gratitude to the fallen and wounded service members who serve us. For those service members who are no longer with us, WE believe we have a civic responsibility to take care of the families that they left behind. Through your generous contribution, WE will bring a smile to some of these children and remind them that WE have not forgotten them or their parents’ sacrifice. Fallen Not Forgotten needs your financial support as well as your networking assistance to make this happen. Fallen Not Forgotten believes in “win-win-win” business situations where WE help you help us help others. Fallen Not Forgotten accepts your contribution and applies ALL funds received to purchasing and sending tablets to gold star children. You get the satisfaction of knowing that you brought a unexpected huge smile to a gold star child or to a child of a wounded service member. The big winners of all of this are the families that know that their fellow citizens have not forgotten them! If you can afford to contribute, WE welcome your assistance. If you cannot contribute at this time, please consider sharing this information with others that may be able to assist in meeting this goal. There is no contribution that is too big or too small – every penny helps! If you or your business, organization, or just a group of friends are interested in sponsoring an entire tablet, please feel free to email us at: fallennotforgotten2012@gmail.com for further information. Please look for us on Facebook (Fallen Not Forgotten, Inc) and follow our progress throughout the holiday season! *Tax deductible receipts are available upon request. Previous Previous post: 4th Annual Tablet For Tots – MISSION COMPLETE!